corresponding to 14:00 UT on December 21. Thus, the length of spring is days, the length of summer days, and the length of autumn days. Finally, the length of winter is the length of the tropical year (i.e., the time period between successive vernal equinoxes), which is days, minus the sum of the lengths of the other three seasons. This gives days. 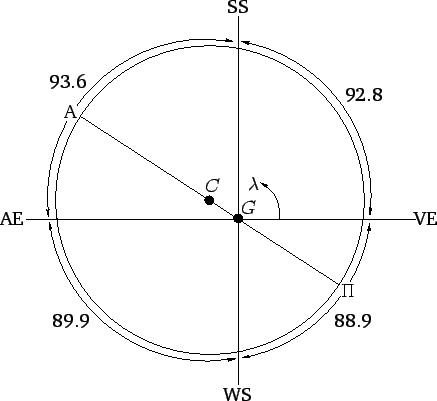 Figure 22: The sun's apparent orbit around the earth, , showing the vernal equinox (VE), summer solstice (SS), autumnal equinox (AE), and winter solstice (WS). Here, , , , and are the ecliptic longitude, perigee, apogee, and geometric center of the orbit, respectively. The lengths of the seasons (in days) are indicated. Figure 22 illustrates the relationship between the equinox and solstice points, and the lengths of the seasons. The earth is displaced from the geometric center of the sun's apparent orbit in the direction of the solar perigee, which presently lies between the winter solstice and the vernal equinox. This displacement (which is greatly exaggerated in the figure) has two effects. Firstly, it causes the arc of the sun's apparent orbit between the summer solstice and autumnal equinox to be longer than that between the winter solstice and the vernal equinox. Secondly, it causes the sun to appear to move faster in winter than in summer, in accordance with Kepler's second law, since the sun is closer to the earth in the former season. Both of these effects tend to lengthen summer, and shorten winter. Hence, summer is presently the longest season, and winter the shortest.